Development Strategies and International Trade Minister Malik Samarawickrama opened the first German Country Pavilion at Build SL 2019 Housing and Construction Expo held at the BMICH yesterday. 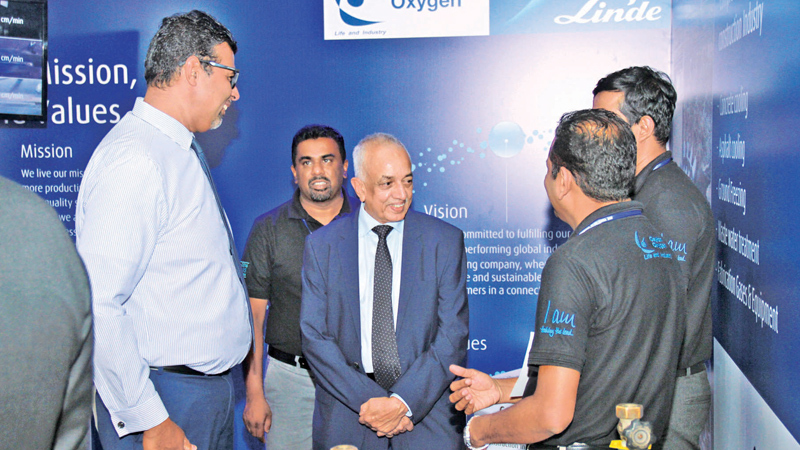 Minister Samarawickrama and Ceylon Oxygen Limited Director Radesh Daluwatte at the company booth. Picture by Shan Rambukwella. Development Strategies and International Trade Minister Malik Samarawickrama said yesterday the introduction of German technology and equipment to the local construction industry will be a huge boon to the local construction sector. The Minister was speaking after opening the German Pavilion at the Build Sri Lanka Housing and Construction Expo 2019 at the BMICH yesterday. The premier construction and housing-related exhibition in the country commenced yesterday and will continue until tomorrow. This exhibition is being held for the 15th consecutive year by the Chamber of Construction Industry, Sri Lanka, which is the apex representative body of the construction industry. The exhibition will showcase the novel and most modern technologies in building construction and housing and it is a ‘must visit’ for those who want to keep abreast of the latest developments in the construction field. “We must appreciate the introduction of advanced German construction technology to Sri Lanka. This will be a great boon to investors in both countries,” Minister Samarawickrama added. He added that the government has provided a number of concessions and incentives to the construction sector through this year’s budget. “We give priority to the construction sector to support speedy development in the country. For this purpose, we will be getting construction technology and equipment from the other countries as well,” the Minister said.